Elsas Life Blog, Personal Development Blog. A pattern: I start with a strong desire. Blogs About Life, Blog On Life, by a Curious Life Blogger. 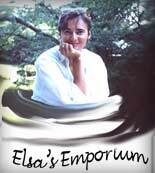 Elsa’s Life Blog, Personal Development Blog. A pattern: I start with a strong desire. Blogs About Life, Blog On Life, by a Curious Life Blogger. I just realized something - about an old pattern, a long-standing pattern. I'm trying to figure out: how much did I benefit? how much does it hold me back? I was remembering how I had learned to swim as a child. I had wanted to learn for years. My mother had shown me many times. I hadn't learned. I loved playing in the water. But I knew I wasn't swimming. I was always letting my feet touch the bottom - and when it started getting too deep, I would quickly get back to where my feet could more easily reach the bottom. I found my way of learning when a big pool opened near where I lived. I was thirteen that summer. I went to the diving board closest to the edge of the pool - and jumped. I had maybe 3 feet to go before I reached the edge of the pool. I was pretty sure I could make it. I was right. I was high as a kite. Ran to get into line to jump again. I did that over and over that day, and the following days. I kept pushing my limit - but not further than I could handle. Instead of jumping toward the side of the pool, I slowly started jumping straight ahead. Eight feet from the edge, instead of three. Then I moved to the next diving board. There were 5 at the pool. Two low ones, left and right. Two higher ones. And then a very high one (by my standards) in the middle. The second diving board was as much of a challenge for me as the little one. Not only did I have to swim further, but I had to face a big fear: to jump from something over six feet up. Terror. I climbed the ladder. I could do that much. Walked along the diving board to the end. I could do that much. There were maybe 20 people in line behind me. I made myself jump. I could do that much. And then I was in the water, going down down down, and then up up up. Swimming was the easy part. I was full of energy, euphoria. I had jumped. A few days later, I pushed myself again. The high board. It was even scarier - but again, in little steps, I was able to do it again. I've never become a great swimmer - but I did learn to swim better and better, not too badly. I never learned how to dive - it wasn't on my urgent list - plus I did a very painful belly flop when I tried on my own. I never took lessons - swimming lessons, let alone diving lessons, weren't something my parents thought of - or something I thought of. My path to becoming a swimmer was suddenly vivid in my mind, because I've just scheduled my first webinar ever. I had already signed up a a webinar service - free for up to 20 people. I could do that much. Then I sent out an email. I could do that much. Got people registering. And now I have to face the technology. And from there it hit me: jumping without knowing how to swim - that hasn't just happened around little things. I've been thinking a lot lately of how important it is to find - or find our way back to - our path, what's right for us. I was also wanting to try doing something new, something scary (for me) - an online webinar. And then it hit me - this is a pattern, a very deeply rooted pattern. I start with desire. I want to swim. I want to do a webinar. And at some point, the urge outweighs the fear. I don't take a lot of lessons, I don't get a lot of help. The lessons and help - if any - come later. This site: I started with the desire to put things on the web. I somehow managed - very very slowly - to put some pages on the web. Then, a year or two later, I found a resource that taught me how to make pages visible. It took months to get things even halfway right - with a huge misunderstanding of something, and an inability to understand something else - all stuff that, later, hearing someone explain it, I was able to grasp within 15 minutes. Over and over and over, this pattern of starting with desire. And then needing to plunge in, without much help, or with no help. Taking the plunge - but not a horrific plunge. No jumping into Niagara Falls to learn how to swim. Not even any desire to get near the Niagara Falls. Desire. That I don't want to change. Swimming - I still want to learn the things I want to learn. But learning by jumping off a diving board, getting in over my head? Is that the best way? I've heard it said that the best thing is to dive right in. I would think that's the best way to drown. Some will survive, sure. Would i have been one of them, if I had dived instead of jumped? - if I had jumped off the high diving board, instead of the lowest? I like the small steps model. All I can think of is: more help along the way. I have gotten stuck searching for help instead of jumping in, by the way. So if I can't find help, I do want to keep making the jump on my own. And with that, I'm back to something else I've been thinking a lot about recently: following one's path. I know we're each born with things that fit for us. I've always loved creative things, especially stories, and ever since I can remember, I've loved thinking big thoughts, trying to make sense of the world. Over and over, a "path" - an interest, a desire - has appeared to me. The start of a story. A question about the world. Very often, I've gone onto the path - started Caro's Quest, following the opening lines that appeared in my head, "Geela Gribbs was known as more than a little weird." The path may take us to unexpected places. I never saw myself as a cat nut - but now, with 9 cats, I'm not far off. It was from following desire each time - desire to rescue a starving cat, a blind cat, another starving cat - desire to let a cat have kittens (and then impossible to give them all away). I like these small creatures - and don't let them out anymore because they kill so many even smaller creatures - birds, mice, little blind voles - that don't have the comfort and shelter of a house. Right now I'm enjoying watching Timothy Cat sleep - a stray I can't keep in the house, for now anyway, because though he's small, he's tough and a fighter - and I'm not willing to have my cats terrorized, or hurt. So the path, now, is seeing if there is a way I can bring him in, keeping the others safe. The path started when he appeared outside, stayed around, friendly and insistent on coming in. One thing after another. His disappearance for days and even a couple of weeks. His reappearance. And now, this early morning, the other cats are in their sleeping area (which started out as the sun room), and he's sleeping on the couch in my study, very relaxed. I will put him outside again in about an hour. Of course lots of food will be left outside for him. We will see where this path takes me. Right now I'm enjoying watching Timothy Cat sleep. I would like to be able to keep him safe. To keep safe and protect - that is a huge desire, for me. And that brings me to ideas. I've been thinking and writing about Islam. A huge underlying impulse: to make the world a safer place, to offer protection - the protection offered by being able to think - to those confused about what to think, how to be inclusive and accepting and yet at the same time figure out what are the limits of inclusiveness and tolerance? should there be limits? I started with interest in something that happened - Muslim fuss about the Danish cartoon - and with desire to understand and then express my understanding. I also started with fear - fear of Muslim reaction, as one hears loads about people forced into hiding by Muslim rage at anything against their way of thinking. I've kept going further and further, into deeper water, but always learning more about swimming (more about Islam) and more about the water. The interest doesn't touch as deep a part of me as Caro's Quest - doesn't come from as deep a part of me - but is there all the same, drawing me along the path. But to get back to my finding my path technique. I wonder: how much benefits me? how much could be better? It's been very helpful for me when a good path is laid out - like school was laid out for me. It taught me to read, add, play volleyball. What has been hardest is when my desires came to brambles, cliffs, pitfalls - or just to no path at all I could see. Often I could see some markings - paths others had taken. I've been told that the best way to succeed is to take someone successful in an allied area, and to model them. You want to play basketball, don't model me. My urge: dodge the basketball. You want to model some big famous basketball star. I am still struggling with paths. I am grateful for paths that appear, that I notice, that I come across. I could do better in finding helpmates. What's the use in hacking out a path if a highway is running along just 50 feet away? Anyway, one of those big things: going to what is right for us, from deep within us from the beginning, and finding a way to those things, best a way that isn't too hard. PS. Sink or swim is a saying everyone knows. What I did is a bit different: jump and swim. Sink or swim: my image is of someone throwing someone else into the water, so they either sink or swim, or of someone accidentally falling into the water, and it's sink or swim. Jump and swim: the impulse for jumping comes from the burning desire to learn how to swim; the distance in the water comes from my awareness that I will only be able to swim a very small distance. PPS. What's your pattern? I'd love to know. to a blog on core beliefs. like this blog on hiding education credentials. Life Blog. Personal Development Blogs. And then it hit me. This is a pattern. I start with desire. Personal Development Blog, Blogs On Life, Blogs About Life.